My first experience in the Camargue was as captain of a luxury hotel barge in 1997-8 or thereabouts. In my mind’s eye (back then) it was a vast swamp dotted with pink flamingos, wild horses and fighting bulls. I didn’t know about the mosquitoes at the time, but I soon found out. In fact I didn’t know about a lot of things, I still don’t, but I’m learning every day! ...and here is one that Estelle Laurent sent me, next time I'll do better! I was right about the flamingos and the horses but I was a bit off on the bulls. 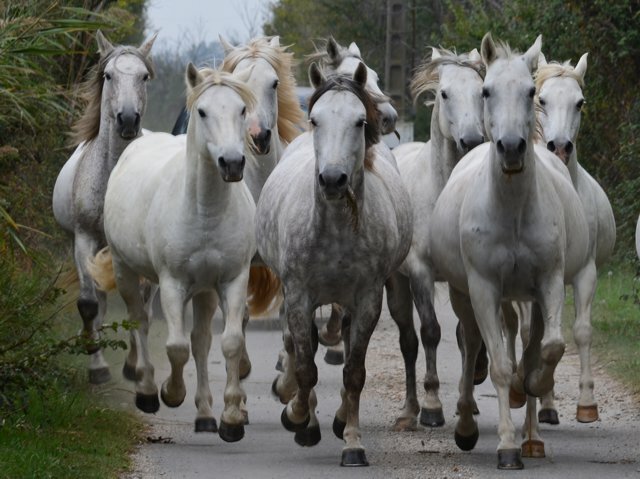 The term “fighting bulls” is wrong when referring to the bulls originally from the Camargue, they are not bred to fight. For those you have to go to Spain or Portugal and although Spanish bulls are sometimes bred in the Camargue they are not the indigenous species. Both varieties are black or dark brown and have remained close to their wild ancestors and both are very bad tempered. 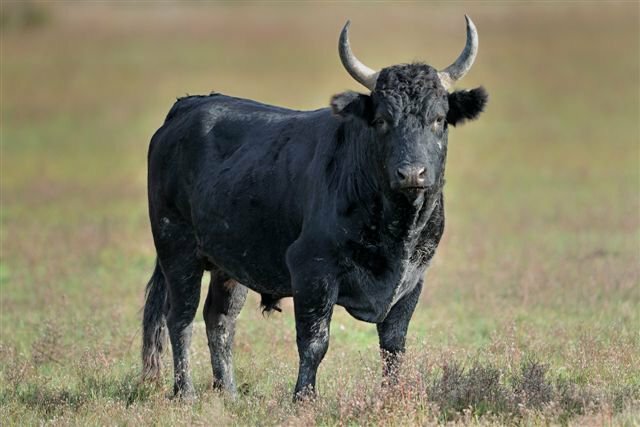 The Camargue bull or the Raço di Biòu has a slightly smaller build than its Iberian cousins, and is raised as semi-wild, they are bred for meat but also for the Courses Camarguaises, more about which later. Now I am not a horse person, I like them as animals to pet and give grass etc. but I don’t ride, in fact if there is no on off switch like on a motorbike or a car I just stay away (apart from the petting and feeding), but I have to admit that these horses have something special, they are majestic and at the same time have a look about them that makes me think of a rather camp male model, the blonde mane swishing in the wind, long blonde eyelashes, the coy but macho look, the burning stare and if they knew how to purse their lips the illusion would be complete. 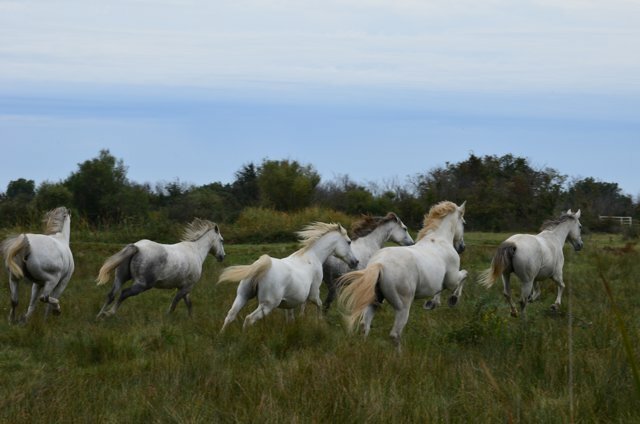 There is never a photo of a Camargue horse looking uninteresting, they always look “fabulous!” manes swishing in the wind, just take a look at the photos that I took and you’ll see what I mean… anyway I digress. These “fabulous” horses are used to round up the angry bulls and so now we bring in the Manadiers. 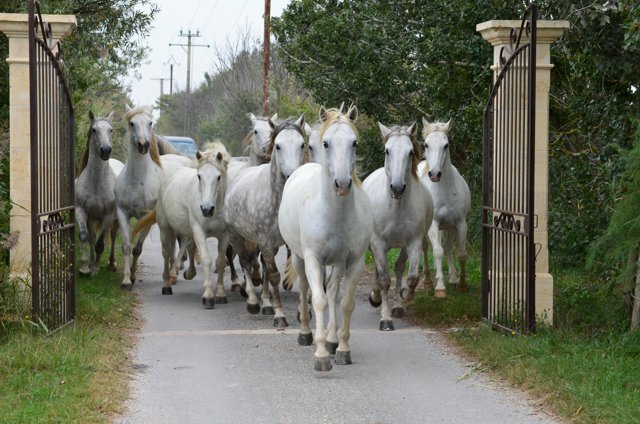 The Manadiers are the cowboys of the Camargue who run the Manades, the name given to the Camargue farms. They live for the horses and bulls, and the pride that they have for their work is impressive indeed. I went to meet Patrick and Estelle Laurent at the Manade Laurent, Les Marquises which occupies 1000 acres of land and produces mainly cattle, rice and breeds horses. The manade is deeply steeped in the family history which in their case is particularly rich. 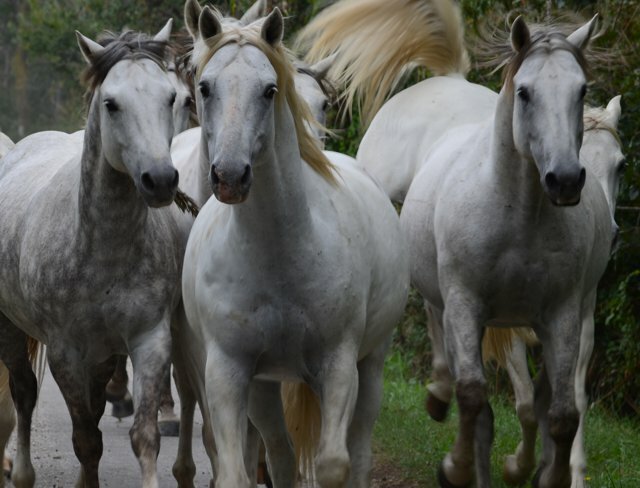 Founded in 1944 by Paul Laurent, the Manade Laurent earned itself a place in the history of the Camargue as Paul gave new life to the Courses Camarguaises thanks to his organisation skills and also the care and attention he gave to his animals. I was greeted by Estelle in full Manadier dress, hat and all, ready to leap on a horse if necessary. We started with a glass of something cool in the house, whilst she told me a bit about the history of the Manade. Every surface available was adorned with trophies, paintings and sculptures of bulls and horses testifying to the incredible legacy that this Manade has and continues to have in the Camargue. Afterwards I met Patrick, who was also dressed the part, and he described the Manades main activities and then invited me to watch the horses that they were going to use the next day, move from one paddock to another. The horses galloped towards us looking “fabulous” and then when in their new paddock gave a display of joy that was truly endearing. They galloped, jumped and kicked out their back legs for several minutes before settling down. I am a strong believer that animals reflect their owners, and these horses were the happiest I had ever seen. 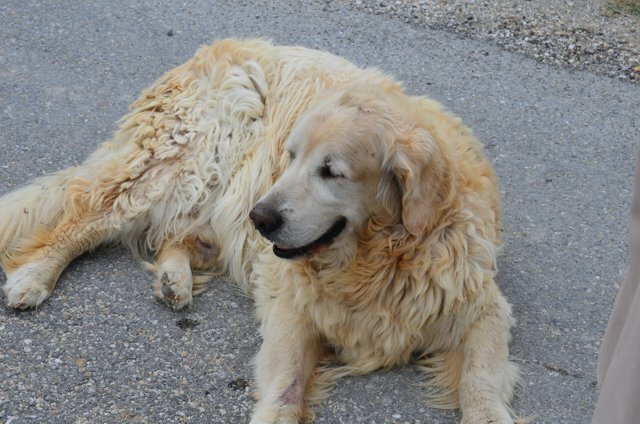 I have also included a photo of their 12 year old Golden Retriever who followed us wherever we went and also bears witness to the Laurent’s care and respect for their animals. The Laurent's Golden Retriever, my kind of dog. A full tour of the Manade takes place on a specially adapted trailer towed behind an appropriate vehicle for the discovery of the property. A horseback option is also available. As you tour you will see the bulls and horses in their semi-wild state, and you soon understand why you are not on foot! It is a fascinating insight into the world of the Camargue “Cowboys” and a culture that is maintained by the palpable pride of the Manadiers. Estelle and Patrick epitomise this culture and are the perfect hosts and guides who seem to never tire from the barrage of questions that I had for them. Whilst on the Manade I made an interesting discovery linking another one of my partners to this wonderful travel experience. L’Occitane en Provence produce a “Sorbet Verbena” refreshing mist which thanks to its fresh lemon fragrance seems to hold the mosquitoes at bay. After a bit of research I found that herbalists have always been using Verbena as a mosquito repellent, and many recommend it as the most effective, so as well as making a product that leaves you smelling and feeling fresh, L’Occitane has unwittingly produced the ideal product for travel to any hot mossie’ infested region of the world! There’s a scoop for you! I could not finish this post without explaining how the Courses Camarguaises work. The Courses Camarguaises which translates as the Camarguaise Races is a tradition that goes back to the 19th century but became organised and regained in popularity in the first half of the 20th century largely thanks to Paul Laurent (see above). The Camargue Bull (Raço di Biòu) is exclusively used for these “races”. The Bull has a string wrapped around each horn the more turns depending on the quality of the bull, another one in between his horns and two pompoms (called a Gland or Acorn) at the base of each horn, these three objects are called “les atributs”. The Bull is released into the arena and there several “raseteurs” dressed in white have to try to remove the atributs using a sort of metal comb. They have to run fast and leap over the wooden barriers to avoid being run through by the long and very sharp horns. The bulls often leap over the barriers as well, or even go straight through them. After 15 minutes the Course stops and another bull is brought in. The star of these events is the bull and the raseteurs often end up for the worse. The bulls can have careers lasting around 10 years and after they retire to the fields of the Camargue to spend the rest of their days. They are never slaughtered. The Manade Laurent won the Biou d’Or (the highest annual award for the Camargue’s prize bull in the Courses Camarguaises) no less than 12 times. One bull stands out from the rest, in 1976 the bull Goya won the Biou d’Or, but remained a star all his life and still is today in the memories of the fans of la Course Camarguaise! Usually the ultimate glorification for a Camargue bull is the erection of a statue in its honour after they die, and this is an honour reserved for very few. Goya’s statue was put up in the town of Beaucaire in 1984 whilst he was still alive, an ultimate homage to this apparently unique bull who participated in no less than 117 Courses Camarguaises and sent many raseteurs and spectators to the emergency units of local hospitals. 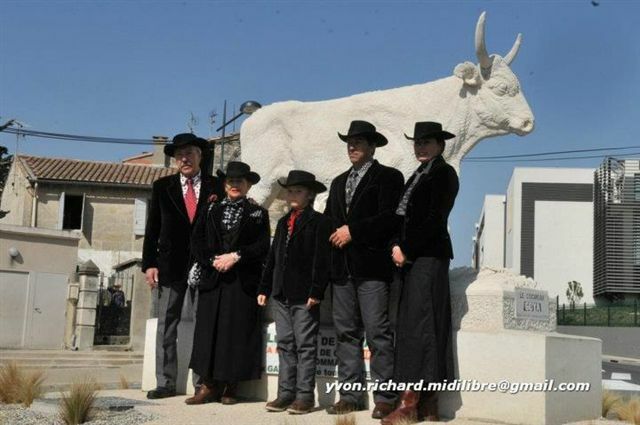 The Laurent Family in front of the statue of Goya in Beaucaire, possibly the most famous bull of all time! Goya was said to be intelligent, agile, cunning, feisty, wild and playful. In fact so playful that he enjoyed goring people with his horns, but “…he never over did it. Once he had gored he moved on, but he was always bang on target” He died in 1986 at the age of 22 in his pastures of the Camargue, which is a good age for a bull or for any bovine. The Courses Camarguaises as you can see are different from Spanish Bullfighting in that the bull lives to see another day. To the question do they suffer, the defenders of this tradition will often say no, I think that do a bit when they go crashing through the wooden barriers around the arena, and sometimes when the raseteur lacks in precision his metal comb can wound the bull. But as you can see in Goya’s case, the bulls live to a ripe old age, which they wouldn’t if they were seriously damaged. And if the Courses Camarguaises didn’t exist then many Manades would stop farming them all together. A visit to the Manade Laurent is part of the 2013 Provence small group tours by Unique Provence for the month of June when nature is at its best. Visits outside of the tours are also possible of course. This is also a perfect tour to combine with a meal at La Chassagnette, more about which you can read here. As always, for more information contact us using the link on the right.